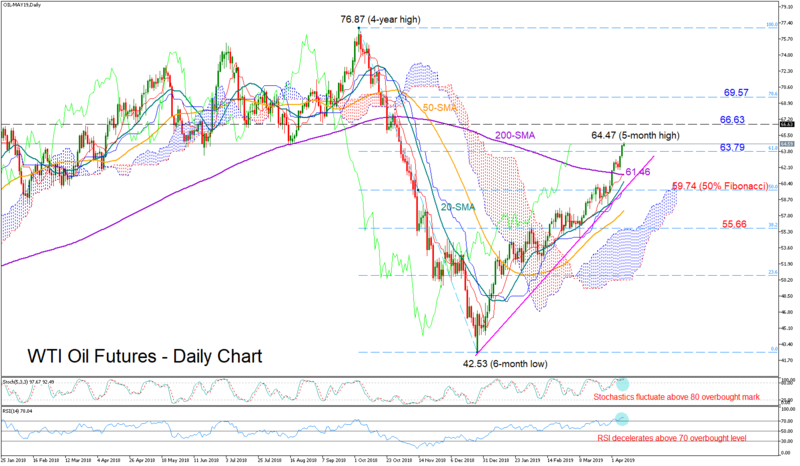 WTI oil futures picked up further steam early on Tuesday to unlock a fresh 5-month high of 64.74. According to the RSI and the Stochastics, the market is trading in overbought zone, suggesting that the price could soon reverse lower. Trend signals, however, are still positive as the bullish action is taking place comfortably above the 200-day simple moving average (SMA), while yesterday’s close above the 61.8% Fibonacci of the downleg from 76.87 to 42.53 is another indication that any weakness may be short-lived. A drop below the 50% Fibonacci of 59.74 and a decisive close under the uptrend line drawn from the low on December 26, could turn the sell-off more convincing, opening the way towards the 50-day SMA (currently at 57.52) and then down to the 38.2% Fibonacci of 55.66. Alternatively, should the price rebound near the 200-day SMA (currently at 57.52), further gains could probably stretch the upward pattern started on December 26 even higher. In such a case, the 66.63 barrier, a former key resistance and support level, could attract attention ahead of the 78.6% Fibonacci of 55.66.